Jasper is creeping up on 17 months old. The exact same age Eden was three years ago when she was diagnosed with stage IV high-risk neuroblastoma. And unless you have had a child who has had some life threatening illness or injury, you can probably only imagine the kind of fear that tries to creep into my psyche. Mental torment is not an exaggeration. To top it off, Eden and Jasper were both born the exact time of year, so at this very moment three years ago, the Spaeth family was having what I thought at the time the BEST summer, yet. And then, just like that, we weren’t. So I’ve been thinking about fear. A lot. You probably haven’t thought about it much (or maybe you have), but fear plays a huge role in our culture, our paradigm, our human existence. Simple searches on the web created an overview of how often we talk about, walk into, and come face to face with fear. Any of these sound familiar? And one wildly popular TV Show a few years back called Fear Factor, where people competed against each other while facing “frightful” (not to mention often disgusting) obstacles. There are 530 documented phobias. To name a few I found interesting: Ablutophobia- Fear of washing or bathing, Chaetophobia- Fear of hair, Cheimatophobia- Fear of cold, Geliophobia- Fear of laughter, Hexakosioihexekontahexaphobia- Fear of the number 666 (I want to know who came up with that one), Ideophobia- Fear of ideas, Lilapsophobia- Fear of tornadoes and hurricanes, Necrophobia- Fear of death or dead things, Phobophobia- Fear of phobias, Soceraphobia- Fear of parents-in-law (Calling Dr. Phil…), and Tonitrophobia- Fear of thunder (Go, OKC!). And that is JUST the word “fear”. What about all the words we use every single day that are basically just synonyms? Worry is fear. Fear that I would look like an idiot when I shaved my head for St. Baldrick’s. Concern is fear. Fear that my oldest child will grow up to be the messiest adult alive. Seriously. I’m concerned. Stress is fear. Fear that my sanity might not survive this Wal-Mart trip with a cranky 16 month old who really wants that bag of candy in the checkout aisle. Insecurity is fear. Fear that I’m not skinny enough, funny enough, pretty enough, smart enough, strong enough…. PTSD is fear. Anxiety is fear. Dread is fear. Doubt is fear. Timidity is fear. Apprehension is fear. Hate is fear. ALL fear. Fear paralyzes, distorts, hinders, lies, blinds, steals, and kills. And, yet, we pay hard-earned money to skydive, hang glide, deep sea dive, cliff climb, bungee jump, zip line, run the rapids, and roll the coasters. We pay to sit in the dark, on the edge of our seats, waiting to be served up a heart attack at any moment. We willingly walk through houses filled with horrors every fall just for the thrill. Can you say love/hate? From another perspective, not all fear is bad, right? I’m sure many a caveman lived to see another day because he feared leaving his cave after dark. It’s called survival, and God equipped us with an amygdala, an almond shaped mass of nuclei located deep within our brain that triggers our survival instincts upon facing fear and distress. Interesting. It’s like God knew we’d need it. Sometimes fear is wisdom, like locking our homes and vehicles and not letting our children play in the street. Sometimes fear is awe and reverence to the most powerful. I think that it is reasonably safe to say that we have all felt and reacted to fear. We parent out of fear. Love out of fear. Hate out of fear. Control out of fear. React out of fear. Befriend out of fear. Say “yes” out of fear. Say “no” out of fear. Even the Son of God was afraid once. HE. SWEAT. BLOOD. When was the last time you were that stressed? Fear is simply part of the human condition. But was it always? And how does God expect me to manage all of the scary stuff in this world? Enter Strong’s Concordance. According to those geniuses, fear (or a synonym of fear) is used 400 times in 385 verses in the King James Version. God knew we would face it, He created our brain to handle it, and, yet, He gives us specific instructions to “Fear not…” numerous times. He wants us to stand in awe of Him, give Him the honor He so deserves, use His Spirit to discern dangerous situations, but He doesn’t want us to be controlled by the Spirit of Fear…..the fear that cripples us. So during my middle-of-the-night thought surges, I began to wonder when is the first time we are introduced to fear in the Bible. You can probably guess…..the Garden. So here are Adam and Eve placed in an exquisite paradise. Everything provided for them….food, shelter, comfort, and fellowship with their Creator, even the freedom of choice. Think about it. Naked but no worries. (That just seems unnatural.) No bug bites. No sunburn. No rashes. No insecurities. Their whole existence was dependent on God’s perfect love and goodness. Remember “….Perfect love drives out fear”…..1 John 4:18. Fear could not exist in a realm where God’s character was never put into question. Then, like with all children, that freedom of choice had to go and reek havoc. Then there were all kinds of reasons to be afraid. Instead of living completely dependent upon a perfect Creator, humans had to rely on their not-so-perfect selves. For food. For shelter. For clothes. For survival. Then along the line, God’s hardheaded people still couldn’t get it, and they asked for the Law. More self-reliance. All the while, God is there practically screaming, “not by power not by might, but by my Spirit (Zachariah 4:6).” He drove His point home when He sent His Son to the cross. When are we ever going to learn that it’s not about us? It’s ALL God. The more we rely on our strengths, wrestle with our weaknesses, believe the enemy’s lies that God is less than He claims to be the more we are controlled by fear. Because let’s face it, we are human. We are imperfect. The world is imperfect. Crappy stuff happens. All. Of. The. Time. Who wouldn’t be afraid? But the minute we make the choice to believe that God is good. That He “only has plans to prosper us and not to harm us (Jeremiah 29:11).” That He does not lie. That He loves us unconditionally. That no matter what we face His perfect love and His perfect promise to “work all things together for good for those who love Him (Romans 8:28)” holds us secure in His hand. We are free from fear. To live without fear is to live solely dependent upon whom God says He is. No one said it would be easy. Not even God (remember all those “Fear nots”?). The world around us mocks us with the contrary. But if we want to live phobia free, we choose to exist without self-reliance but with God-reliance. There is an AllState Insurance commercial that sums it up beautifully. And just as fear is an emotion engraved in our beings, there is a yearning in our souls to rely on God’s character. To know deep down that good has already conquered evil through the cross. Our only job is to trust and believe that all the bad things that can happen in life can’t stop GOD from making our lives good. It’s how I live in a world where childhood cancer exists and kills innocent lives. God is my fear insurance. And I am in good hands. P.S. Don’t fear! There’s still time to register for the Be A Firework! glow-in-the-dark 5k. Register early to guarantee your t-shirt and glow stuff! Click on the link below!!! You know you want to…..
Register for our Glow in the Dark 5k Now! While we want to happily announce how you can register for our Be a Firework glow-in-the-dark 5k run today, we want to first say that our hearts are just simply devastated over the tornado destruction that has so greatly affected our home state. Our prayers are going up, especially on behalf of the families whose children are unaccounted for at this moment. Justin and I know all too well the heart-wrenching pain that comes with knowing your children are in danger, and there is absolutely nothing you can do about it. May God’s grace pour out on each and every victim and sustain them like only He can do! You can now register for our Be a Firework glow-in-the-dark 5k run now! To Register, Click on the Link Below. Fill out the form. Email it back to me or mail it PO Box 2017 Woodward, OK 73802. Checks made payable to Eden’s Fireworks Foundation. Credit Cards accepted on our PayPal account. Simply click our DONATE button on our Be a Firework page. Reference your payment as 5k. Hard copies of the registration form also available at Cafe Eden, 1018 Main St in Woodward, OK.
Again, we are still looking for corporate sponsors for this 5k run. Please contact us if you are interested in helping our first event become a huge success. There are a lot of childhood cancer warriors who need a little love and a little hope!! Yesterday, I asked you to join me on a mission to fight childhood cancer. As you follow my blog, I will be giving you specific actions that you can take to help in this mission. Your very first assignment is to join us for our 1st Annual BE A FIREWORK glow-in-the-dark 5k race. Whether you are an avid runner or someone who prefers a leisurely walk, you can sign up and have a blast with us. Mark your calendars for Saturday, August 10 in Woodward, OK now. Directions will follow on how to register both online and in person. This will be Northwest Oklahoma’s first 5k of this kind, and I know you will want to be a part! ALL proceeds will go directly to a helping a child fighting cancer, either financially or emotionally or both. We have grand ideas for showing these kids love and hope, but, obviously, we need the funds in order to carry them out. You can help by taking part in our first big fundraiser. So if yesterday my post left you asking, “But what can I do?”, your question has been answered. Eden’s Fireworks Foundation is looking for corporate sponsors for this big event. If you have or know someone who has a business that is into life-changing missions like we are, we would love to hear from you! Of course, all donations are tax-deductible and advertising would be an added bonus. Well, here I am. The moment for which I’ve been waiting 7 months since starting Eden’s Fireworks Foundation. In the internet-dependent world in which we live, I can now say “WE ARE OFFICIAL!” – professionally designed website and all…. Obviously, I have thought a lot about what to write in my first blog since, well, forever. I’m thinking I may be a bit rusty because I have all of these thoughts and ideas I want to tell you about and no coherent theme in which to put them. Figures. But one thought does stand out. A few months after Eden passed away, Lady Gaga premiered her single “Edge of Glory” on the American Idol stage (some of you may remember). At the end of the performance, she and a male dancer held hands and jumped off a fairly tall set piece, obviously signifying their leap off the “edge”, so to speak. I heard all kinds of opinions of her performance, mainly on FB, of course. But some in person from a few of my friends. Many were appalled because they interpreted their jump as open encouragement for suicide. I, obviously, do not know exactly the inspiration behind Gaga’s stage blocking and choreography, but I suspect her motives were unlikely suicidal. I have a point (by the way). While Eden was going through treatment, I proclaimed that I served a God of miracles. That Eden was going to be one. That God would get the glory. If I were a poker player, you could say I went all in. I remember telling my mom once, “If Eden doesn’t survive this, I’m going to look really stupid.” I guess that’s up for debate at this point. So here I am again. With everything on the line. I am all in to fighting childhood cancer. Any and every way I know how. And my challenge for you? Join me. Go all in. A life worth living is, indeed, one lived full out. One lived on the edge of glory. One lived out of your comfort zone. One lived in faith. It’s from this kind of life that miracles come to fruition, that passion changes lives, that people become world-changers. I’m going to take Eden’s lead. Be a firework. And recruit others. To see miracles. To change lives. To become a world-changer. Who’s with me? Big things are happening! A huge announcement will be made tomorrow, including details about our first Fireworks event/fundraiser. Please share this page, our FB page, our Twitter page……We need more fireworks!!! 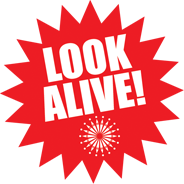 Oh, and LOOK ALIVE! Always.